1980 goldwing or goldwing interstate? 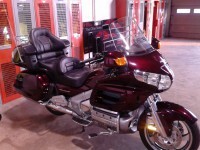 Re: 1980 goldwing or goldwing interstate? 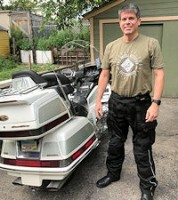 The most obvious way to tell is that the Goldwing Interstate came with a fairing, trunk and pannier (saddle) bags, and the Goldwing Standard did not. That's the main difference. That said, many Standards had aftermarket Vetter fairings and bags added to them. Look at the gooseneck, serial number etc...are on there... and I think it should have it on there. you can go exactly .4 miles with the petcock turned off. Unless someone (like me) has changed them. I got tired of dealing with the horns in front of the radiator every time I had to pull the radiator, so I moved mine to the sides, inside the lower fairings. I'd download the Honda service manual (if you don't have one already) and go through the engine removal/installation procedures before you start. It's not all that difficult, and it's a great way to get to know your bike. Mshawn, depending on the age og the carbs and if you remove them, be sure to pop off the two screws that house the air-cutoff valves. They are of a diaphragm nature. Mine must have been 30 years old and the originals. A big gooey soupy rubbery mess is what I found. Hopefully your luck is better than mine.